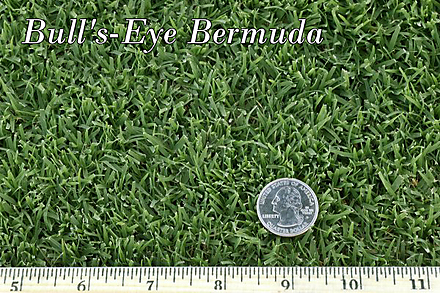 Bull’s-Eye Bermuda® (also known as BOBSod® in Arizona) offers the most beautiful blue-green color and best shade tolerance of all the bermudas. It combines the beautiful color of bluegrass, the texture and feel of zoysiagrass, and the durability of Tifway. Bull’s-Eye is exceptionally tough, has virtually no seed heads, and resists scalping. Like all our hybrid bermudas, Bull's-Eye is a drought tolerant grass, and requires very little water compared to cool season grasses like fescue. Barona Ranch Golf Course—18-hole public golf club in San Diego, CA, designed by Gary Roger Baird and Todd Eckenrode. 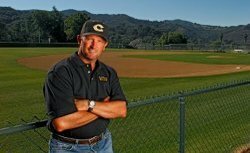 Calabasas High School—State of the art new baseball field built by 2-time Cy Young Award Winner and 1985 World Series MVP Bret Saberhagen in Calabasas, CA. Chase Field--Home of the 2001 World Series Champion Arizona Diamondbacks. Home Depot Center—Home of the Los Angeles Galaxy, AEG Live, US Soccer Federation, United States Tennis Association, USA Cycling ,and United States Track and Field, in Carson, CA. Kauffman Stadium—Home of the Kansas City Royals. PetCo Park—Home of the San Diego Padres. Querencia—18-hole private golf course in Los Cabos, Mexico, designed by Tom Fazio. Surprise Recreation Campus—55 acres of turf and Home of the Kansas City Royals and Texas Rangers Spring Training facilities in Surprise, AZ. Named Sports Turf Managers Association 2004 Professional Complex of the Year. The Grand—18-hole golf course in Del Mar, CA, designed by Tom Fazio. The Rose Bowl—Home of college football’s prestigious bowl game, Pasadena, CA. Medium-wide blade provides texture contrast. Appearance is coarser than Tifway, yet finer than common bermuda. Top ranked in quality studies of bermudagrass cultivars conducted by Mississippi State University. (tested as MSB-30). Highly ranked in quality studies of bermudagrass cultivars conducted by the National Turfgrass Evaluation Program. Thick, closed canopy creates resilient cushion and carpet-like feel. Compact growth habit causes golf ball to sit-up on blades for a great lie. Improved footing on sports fields due to tightly packed leaves near the soil surface. No seed heads and low nitrogen requirement means less mowing. Exhibits surprising shade tolerance for tree-lined stadiums and stadium. Thrives in warm to hot climates. Moderate level of maintenance required. Fall overseeding may be necessary for winter color. Reel or sharp rotary mower.